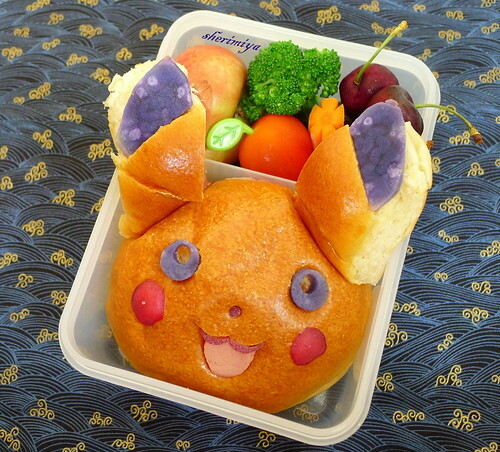 Pikachu Bao Bento, a photo by sherimiya ♥ on Flickr. We haven't had a char siu bao bento in awhile so, here's one for July. I made Pikachu using a bao and a hot dog bao cut in half for ears. I added ear and eye details with Okinawan sweet potato, radish for cheeks, purple carrot for nose and mouth, and hot dog for tongue. Okay, the ears aren't as pointy as they should be. I had to tell MisterMan what it was supposed to be, and he said "Oh, Pichu? It looks more like Pichu." All right then. If you don't know (and I didn't), Pichu is the pre-evolved version of Pikachu. I guess that's appropriate! He also gets a donut nectarine (not very sweet), steamed broccoli, cherry tomato, carrots and cherries. Happy Wednesday! Bobo, that's sweet. Thank you. Debra, I would groan, but of course I love your pun. Thank you! I love the blank canvas of glistening domed bread. haha love the sweet potato effect! And especially so the radish blush! Aw.. it's been a while since your last Pokemon character! And here's another super cutie one.. I especially love the potato ears! Clever, clever.. hehe.. I could eat this for breakfast it looks yummy! So cute! I need to finally try bao, too. Did the ears still fit when the lid was chlosed? Sorry the donut nectarines aren't that good. I've never had them, they look cool though. I love you Pichu bao, he's awesome! You are the premier Bao artist! I love your creation :) I've had the same thing happen with A-chan, "That's not Pikachu mommy, it's Pichu!" Lol. Oh, this is absolutely adorable ! A Pikachu Bento !!! You are so talented and creative. Thanks for sharing. 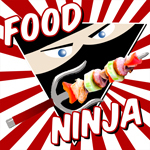 Sheri, you are the master of bao charaben! Pikachu is perfect!!! Chantale, it has been a long time since I've made Pokemon. Hmmm. This was supposed to be the summer of charaben too. I should get on the ball. Thanks! Susan, not a master! Always trying to be better. Thanks!